Hubert Howe Bancroft Photograph, ca. 1852. Bancroft left New York by steamer on February 24, 1852, arriving in San Francisco, via the Isthmus of Panama, on April 1. Though not quite twenty, Bancroft had been entrusted with an important consignment of books and stationery to sell for his brother-in-law, George H. Derby. While awaiting the arrival of the shipment, sent by clipper by way of Cape Horn, Bancroft and his good friend and fellow clerk, George L. Kenny, worked at a quartz mine at Long Bar and in a general merchandise store in Rich Bar. George H. Derby. 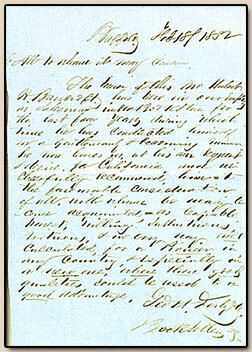 Letter of introduction provided to Hubert Howe Bancroft upon his departure for California. Buffalo, New York, 18 February 1852. With H. H. Bancroft’s business card. Derby recommends Bancroft "as capable honest, willing, industrious, virtuous, & in every way well calculated for a Pioneer in any Country, & especially in a new one, where these good qualities could be used to a good advantage." List of Valuable Books for Sale by H. H. Bancroft and Geo. L. Kenny, Sacramento City, California. [Sacramento, Calif.: Bancroft & Kenny, 1852]. When Bancroft arrived in California, he went first to Sacramento to make contact with commission merchants to whom his brother-in-law had previously sent consignments. 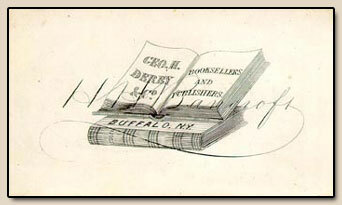 George H. Derby's untimely death, at age thirty, on September 15, left Bancroft and Kenny with the task of selling the stock as soon as possible so that Derby's estate could be settled. Kenny then entered a partnership with William B. Cooke in San Francisco, where he successfully sold all the books. In 1856, Bancroft's widowed sister, Cecilia, loaned Hubert the $5,500 profit from the sale as capital with which to start a business in San Francisco. Document recording the dissolution of Hubert Howe Bancroft's partnership with David Kendall and George Fairfield, in the firm Fairfield & Co., Crescent City, California. 1 January 1854. In Crescent City in 1853, Bancroft first worked for a general merchandise store, Crowell and Fairfield, keeping their accounts as well as selling some of his own book stock. When the firm failed, he bought up some of the remaining merchandise, but soon disposed of his interest, invested the proceeds, and returned to San Francisco. William H. Knight, editor. Hand-book Almanac for the Pacific States; an Official Register and Business Directory. San Francisco: H. H. Bancroft and Company, 1862. Knight joined The Bancroft staff in 1860 to edit a series of handbook guides to the Pacific States, the first of which appeared in 1862. His work proved to be the seed bed for The Bancroft Library. "Mr. Bancroft went East in 1862 [more probably 1860] and on his return a few months later I accompanied him through the store occupying two deep floors on Montgomery and Merchant streets. He stopped at an alcove near my desk, containing about 100 volumes of various sizes, old and new, and not presenting a very artistic appearance. He asked what they were. I told him that they all pertained to the geography, history and mining of the region embraced in our map [a general map of the Pacific Coast]. He gave a cursory glance at some of the books, said nothing, and we passed on through the establishment. Returning, we again stopped at the historical alcove and he said, ‘Mr. Knight, I wish you would visit all the other bookstores and stands in the city and purchase a copy of every book and pamphlet relating to this territory that is not already on your shelves.’ With characteristic prompt decision he had instantly decided to form a complete Pacific Coast Library." (William H. Knight, "Bancroft’s Exhaustive Work Described by Col- laborator," Los Angeles Times, March 10, 1918). Hubert Howe Bancroft. "Chapter XVI--Evolution of a Library." Manuscript, n.d. In these beginning pages of a draft chapter about the creation of his library, Bancroft explains that "I hardly know what started me off collecting books--trash, my clerks would call it,--me, a west- coast trafficker in books, handling them as one handles bricks, not for the knowledge but for the profit in them." He merely thought "it might be worth something sometime." Meanwhile, books were just good to have around. Passport for Hubert Howe Bancroft, 23 August 1862. On this, his first trip to Europe, Bancroft collected enough books to fill 12 packing cases. Hubert Howe Bancroft. "Journal of H. H. Bancroft while in Europe, 1866-7." Manuscript. Once again Bancroft traveled in Europe, this time accompanied by his wife, Emily. During this full year abroad, he visited London, Paris, Madrid, Rome, Leipzig, Prague, Munich, and places in between, buying every available book, pamphlet, and manuscript relevant to his growing collection. In this passage, written near the end of his stay, he is again in London: "I have spent much of my time book hunting. This is a business well understood here. ‘I was mad on American books once myself’ Mr. Bohu says. I do not know what use the books on the Pacific Coast will be put to, but they will be very valuable to the coast, to somebody sometime, or rather always." Hubert Howe Bancroft. Draft text about book collecting. Manuscript, n.d.
"When first seized with the malady--not of lying but of book-collecting--I was quite young, too young to know how ill I was. California clearly displayed mercantile rather than a manufacturing proclivities, and yet I would fain force the situation and rise from selling books to making them." Cross-section view of The Bancroft Building. Engraving, 1870s. With both his business and his library outgrowing the original quarters at Montgomery and Merchant Streets, Bancroft constructed a new five-story building at 721 Market Street in 1869, moving his library into the fifth floor in 1870. Working documents, The Bancroft Library. Manuscripts, ca. 1880s. Library staff at Bancroft’s library faced many of the tasks and problems besetting all libraries: compiling holdings of serials, devising storage schemes, and refining subject headings. Catalogue d'une Collection de Livres Rares (Principalement sur l'Histoire et la Linguistique) Réunie au Mexique, par M.***, Attaché a la Cour de l'Empereur Maximilien, dont la Vente se Fera le Mardi 3 Novembre 1868 et le Jour Suivant. . . . Paris: Librairie Tross, 1868. Bancroft’s London agent, Whitaker, represented him at this first sale to result from the collapse of the Mexican Empire and the execution of Maximilian. 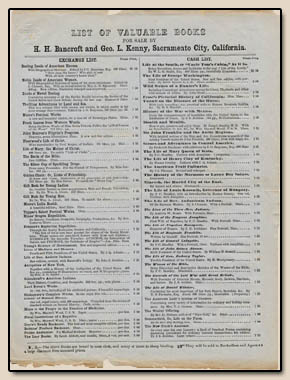 His successes and losses were recorded in Bancroft's marked copy of the auction catalog. José Maria Andrade. Catalogue de la Riche Bibliotheque de D. José Maria Andrade. Livres Manuscrits el Imprimés.... 7,000 Pièces et Volumes ayant Rapport au Mexique ou Imprimés ce Pays, dont la Vente se Fera Lundi 18 Janvier 1869 et Jours Suivants . . . . Leipzig: List & Francke, 1869. "List & Franck--Leipzig, from Whitaker: London. Andrade'sche Auction." Manuscript, 1869. Again represented by Whitaker, Bancroft acquired nearly half of the 7,000 items gathered by the great Mexican collector José Maria Andrade as the basis of a national library to be established by the ill-fated Prince Maximilian--an astounding purchase for Bancroft’s growing Pacific library. "Bosquetti’s Catalogue of Bancroft Library." Manuscript, 1869. 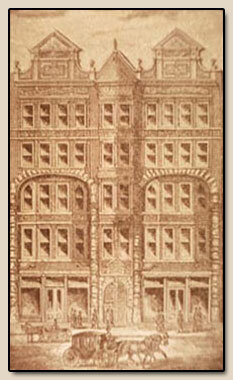 In 1869, Bancroft engaged an Englishman, W. Newbery Bosquetti, to put into order the materials acquired from the Andrade sale and to prepare for the move to the Market Street building. Bosquetti was appealing because "he was remarkably quick and clear-headed in some directions, and a good talker on almost any subject. . . He had some knowledge of books and even of cataloguing." Unfortunately, as Bancroft went on to observe in Literary Industries, "the capability of producing finished results was wanting," and the work of cataloging soon fell entirely to Henry L. Oak. 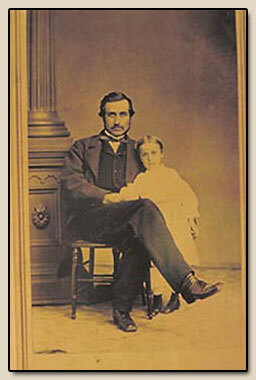 Hubert Howe Bancroft and his daughter Kate. Henry L. Oak. 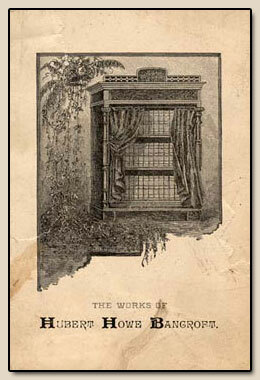 "Catalogue of Books and Pamphlets in The Bancroft Library, San Francisco, Cal., 1870)." Manuscript. Henry Lebbeus Oak was the young editor of the Occident, a Presbyterian journal published by the Bancroft house, when he was enlisted to assist with the cataloging of the library prior to its move to the fifth floor of the new, but yet unfinished, Bancroft Building on Market Street. This small book, with Oak's supplements as new lots of materials arrived, served the Pacific Library, as it was first called, for the next twelve years. Henry L. Oak. Photograph, ca. 1870. 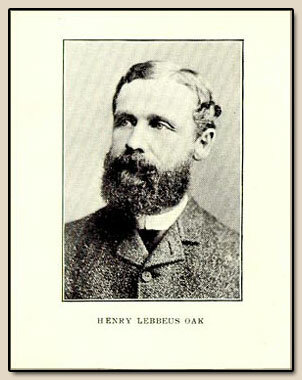 Henry Lebbeus Oak was born at Garland, Maine, in 1844. 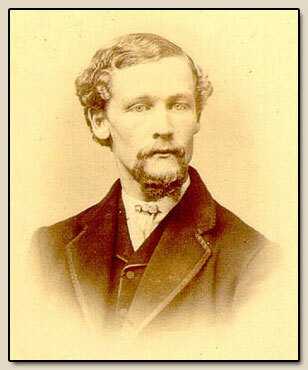 He entered Bowdoin College and graduated from Dartmouth in 1865, intending to become a teacher. 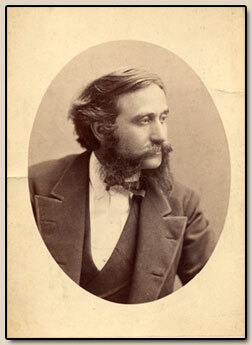 His association with Bancroft began in 1868, when he was the office editor of the Occident. Besides being a librarian from 1869 until 1887, Oak supervised the literary work going on in the library and wrote large portions of Bancroft’s histories. 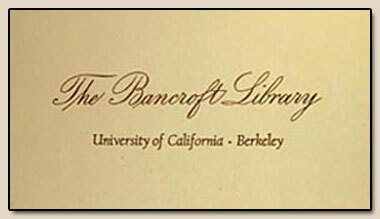 Sample cards from The Bancroft Library catalog begun in 1869-70. Although Henry L. Oak knew something of books from his college studies, he knew nothing of cataloging. Yet, with the departure of Bosquetti in 1869, he was soon left with the task of cataloging Bancroft’s entire collection in anticipation of the move to new quarters, a task which took him over a year. The system he devised, though redundant, won Bancroft’s approval: The full title of each work, with other bibliographic information, was recorded on sheets of heavy writing paper cut to 3½ inches by 5 inches. These were then abridged onto small, 2½ by 4 inch cards, which were arranged alphabetically by author or other main entry. Finally, the information from the small cards was copied into a blank book. The books themselves were also alphabetically arranged, tied into bundles, and placed in 121 large cases for transfer. Invitation to the opening of the Market Street building, San Francisco, July 30, 1870. In ten years, Bancroft's collection, numbering by then more than 10,000 items, had outgrown the second-story corner allotted to it in H. H. Bancroft & Co, Booksellers & Stationers, on Montgomery and Merchant Streets. Indeed, the business Bancroft had established in 1856, as a young man of twenty-four, had also outgrown its quarters in 1869 and a new building was constructed on Market Street. The Bancroft Building, 721 Market Street, ca. 1874. Original gouache sketch of the fifth floor work area assigned to the writers Cerutti, Griffin, Harcourt, Nemos, and Savage during the preliminary stages of research for Bancroft’s Works. Details include tables for indexers and copyists, a map rack, and books from Bancroft’s growing collection. Catalogue of a Scarce and Curious Collection of Books and Pamphlets, Relating to the History and Literature of America. . . . for sale by E. P. Boon, Agent. . . . New York: E. Wells Sacket, Stationer and Printer, 1871. A dealer’s catalog recording some of Bancroft’s early purchases, among them--for fifty cents--the first item in the catalog, also shown here: James Abbey’s California. A trip Across the Plains, in the Spring of 1850, Being a Daily Record of Incidents of the Trip over the Plains. . ., New Albany, Ind. : Kent & Norman, and J.R. Nunemacher, 1850. Hubert Howe Bancroft. "Old List of Books Wanted." Manuscript, 1870s. Bancroft staff combed library catalogs and bibliographies, compiling lists of books to be acquired. These were sought out on buying trips and in contacts with booksellers, with successes noted in Bancroft’s pocket notebook. Hubert Howe Bancroft. Notebook of books wanted. Manuscript, 1870s. Of particular interest in this pocket notebook, with its alphabetical list of desiderata, are the notations inside the front cover. Here are listed some of the dealers who acted as Bancroft's representatives at major nineteenth-century auctions. General Mariano Guadalupe Vallejo. Photograph, n.d. The high point in Bancroft’s collecting of Californiana was the winning of General Mariano Guadalupe Vallejo’s friendship. Vallejo was a leader among the Californios, one who as an official for many years had accumulated a quantity of records which were, in effect, the official archive of the Mexican government in California. Henry Cerruti. Letter to Henry L. Oak. Sonoma, 12 April 1874. Vallejo held himself aloof from the American immigrants pouring in and was engaged in writing his own history of California when Bancroft employee Henry Cerruti gained his confidence. At first Vallejo permitted Cerruti to examine a few documents, then lent him a few to copy, then allowed his entire collection to be taken for copying, and finally presented them as an outright gift to Bancroft. Vallejo went on to dictate, in 1874-75. a long reminiscence, aptly titled "Historia de California." Finally, Vallejo was instrumental in urging his countrymen also to place their papers at Bancroft’s disposal. 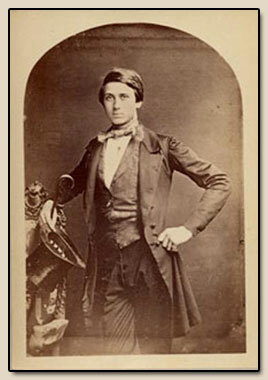 On April 2, 1874, Cerruti inscribed the verso of his portrait with characteristic charm: "Respect- fully dedicated to my esteemed friend Miss Maria Vallejo by her obt. servant, Henry Cerruti." Henry Cerruti. "Ramblings in California." Manuscript, 1874. Not only did the effervescent Cerruti charm General Vallejo--as he had previously charmed Bancroft--but, with the General’s support, and often with him at his side, he gathered documents from the old families of California. When not busy at the General’s estate, Cerruti roamed Sonoma and the surrounding countryside in search of pioneers who could be persuaded to sit down and recall their adventures for his waiting pen. Bancroft was delighted with the results and urged him to set down a record of his own adventures in the cause of California history-and The Bancroft Library’s collections. Hubert Howe Bancroft. "Personal Observations during a Tour through the Line of Missions of Upper California." Manuscript, 1874. On February 18, Bancroft set off with his daughter Kate and his librarian, Henry L. Oak, on a steamer bound for San Diego, intending to make the return by land, visiting each mission in turn. "This I intend as the first of a series of literary excursions," he wrote, "in which I hope to obtain not only much valuable information from the archives lodged in various corners, and from living witness of historical scenes, but a better knowledge of the country in which those scenes were acted and of the people who took part in them. More particularly do I wish to ascertain, so far as possible, a knowledge of all material for history extant, what it is and where it is, so that I and others may have the benefit of such knowledge in future investigations." Already on February 23 he writes of having that day purchased "Ju[d]ge Hayes’ entire collection of books manuscripts, and papers concerning Pacific Coast matters"--the gatherings of twenty-five years, an invaluable accumulation of information about the history of California. "Commencement at Yale," New Haven Daily Palladium, 2 July 1875. Bancroft received an honorary degree from Yale in 1875 in recognition of his Native Races of the Pacific States. This same year, Bancroft was elected to membership in the American Antiquarian Society, the American Ethnological Society, and the Massachusetts Historical Society. Bancroft Library visitors book. Manuscript, 1876-present. Anne Bancroft presented the guest book of her grandfather’s library to The Bancroft Library in 1950. The first entry in the book of "Visitors to The Bancroft Library," dated 24 January 1876, is "Juan B. Alvarado, San Pablo." At that time Governor Alvarado was dictating his valuable five- volume "Historia de California," now one of The Bancroft treasures. The book was in active use until 1892--then, since many empty pages remained, Director George P. Hammond reinstated its use. William Nemos. "Library work--done & to be done." Manuscript, 1870s. 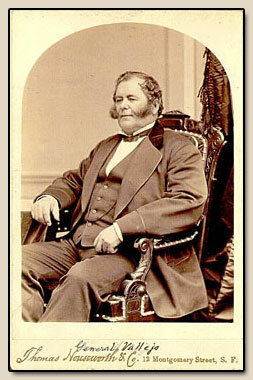 William Nemos was a gifted Swedish writer who entered the library in 1873, subsequently becoming Oak’s chief assistant. Here he describes the intensive ongoing work of cataloging, arranging, and indexing Bancroft’s collection. When Oak retired in 1887, Nemos became his successor in the librarian’s office, but he himself left in 1888. Thomas Savage. "Report of Labors in Archives and Procuring Material for History of California, 1876-9." Manuscript, 1879. 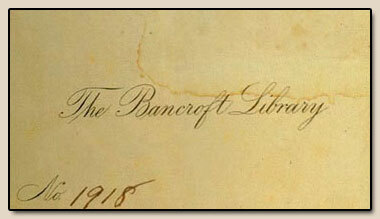 What Bancroft was not able to obtain in the original, he sent staff to copy. In this volume, written in 1879, Savage details his trips throughout California to secure copies of manuscripts and archives as well as dictations from pioneers. Here he describes the work of abstracting the records of the United States Surveyor General’s office. The original records were destroyed in the 1906 San Francisco earthquake and fire. Hubert Howe Bancroft. Notebook of contacts. Manuscript, ca. 1876-79. On the flyleaf Bancroft described the contents of this pocket notebook as "Men useful in working History to whom we may write. Entered according to state, city, or nation, as London, Paris, Mexico, Massachusetts etc." These were prospects of all kind--sales, book reviews, information, materials. Often, as on these pages among the Oregon entries, Bancroft noted his expectations: "promised some documents," "knows about Southern Or. & will answer questions & letters," " will send material." In other places he noted the results of visits, copies of books sent as gifts, and intended actions. Catalogue of the Library of E.G. Squier. Ed. by Joseph Sabin. To be Sold by Auction . . . April 24th, 1876, and Following Days. New York: C.C. Shelley, Printer, 1876. Squier had made use of the opportunity provided him as United States Minister to Central America to make a rich collection of manuscripts, maps, Central American newspapers, and political and historical pamphlets. A large part of the manuscript collection was obtained from archives and depositors in Spain; but a considerable number of those relating to Central America had been personally acquired while he was resident there. At the sale of Squier’s collection, Bancroft acquired whatever he could that was not already in his own library. Bancroft’s personal copy of the catalog notes purchases made, price paid, and often the library classification later given the item. Hubert Howe Bancroft. Letterpress copy book, 1869-1876. This letterpress copy book was kept primarily for letters sent to agents, mostly European, who were authorized to purchase materials for Bancroft, usually at auction. Shown is the list sent on l4 April 1876 to Sabin & Sons regarding items wanted from the Squier auction. Hubert Howe Bancroft’s notes of his visit to the University of California library. Manuscript, December 1877. Bancroft came to see what the Berkeley library "contained on Pacific Coast affairs." Although he does not record an overt judgement, his description of the materials found implies that he was not impressed. Estes & Lauriat, Publishers and Booksellers. Letter to H. H. Bancroft. Boston, 28 October 1879. Prominent in Mr. Cushing’s library was "the number of books in the Spanish language relating to the history of Spain, Mexico, Cuba, Porto Rico, and the Spanish Provinces in South America." Bancroft’s purchases, 29 lots in all, were heavily concentrated in sets relating to Mexican law. His agent’s letter enclosing the invoice voices a mild complaint---more a worry, really---about Bancroft’s "blank check" approach to bidding. Bibliotheca Mexicana; or, A Catalogue of the Library of Rare Books and Important Manuscripts Relating to Mexico and Other Parts of Spanish America, Formed by the Late Señor Don José Fernando Ramirez . . . To Be Sold at Auction. . . London: [G. Norman and Son, printers], 1880. From his youth, Ramirez had been an avid book and manuscript collector. When he left his native Durango for a post in the national government in 1850, he sold the greater portion of the library he had formed there, reserving, however, the rarest works relating to the archaeology, history, and philology of Mexico. These he brought with him to the capitol as the foundation of a second library. The suppression of the monastic orders in Mexico gave him extraordinary facilities for acquiring rare books and manuscripts and he came into possession of many literary treasures. His eminent reputation as a collector, bibliographer, and scholar also enabled him to procure copies of unpublished documents inaccessible to others. For a number of years he was head of the National Museum of Mexico. In 1851 President Arista made him his Minister of Foreign Affairs. Emperor Maximilian charged him with the formation of his first Ministry and named him its president. Two years later, at the end of the French expedition, Ramirez too left. Once again Bancroft made out his list and sent it to his agent, Stevens. He set no limit and expected the lots would come to $10-12,000. Although Stevens wrote, "On the whole you have secured your lots very reasonably. A few are dear; most of them are cheap," Bancroft’s bill still came to nearly $30,000! "Authorities--Central America and Mexico." Manuscript, ca. 1880. The wealth of resources gathered for Bancroft’s library--and used in the production of his histories, can be seen in the "Authorities Quoted" section included with each history. Seen here is an early draft of the bibliography for a combined history of Central America and Mexico, histories which were eventually issued separately in three and six volume sets, respectively. List of library contents as boxed for the move to 1538 Valencia Street. Manuscript, 1881. Slightly more than a decade after the move to Market Street, Henry L. Oak again faced moving the library. This time there were 622 boxes, as compared to 121 in 1870, but not all contained books, manuscripts, and other library holdings. Some were supplies such as ink, bottles, tissue paper for press copying, slips of colored paper for book marks, pictures for Mrs. Victor’s room, and the inevitable box of "odds and ends" (box 374). "Catalogue of The Bancroft Library of Pacific Coast Books, Maps and Manuscripts: Valencia Street, San Francisco." Manuscript, 1880. The new library, with its opportunity to arrange and interfile volumes, also occasioned a new catalog. The small card catalog of abbreviated titles as well as the sheets with full bibliographic information had been kept meticulously current by Henry Oak. Now, in two large folio volumes, popularly known as "the Valencia Street catalog," a finding list, recorded alphabetically by author or other main entry, for all the volumes of the library was created. A marginal notation gave the classification (reference, bibliography, rare book, manuscript, etc.) and the numerical location of each item. Supplements were added after the move and later notations record classifications after the library’s purchase by the University of California. As Henry L. Oak prepared the library for shelving in its new library building, he carefully book- plated the entire collection to reflect its arrangement by document type and subject. In 1963, The Bancroft Library returned to the style of these original bookplates, a style which also reflects the silver plate now gracing the library’s gallery entrance--that once welcomed visitors to the Valencia Street library. "The Pacific Coast Library: Removal of the Collection to New Quarters." San Francisco Chronicle, 13 December 1881. 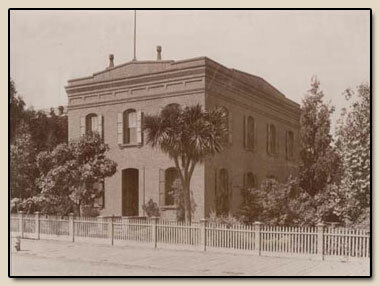 In 1881, on a large lot on Valencia Street near Mission, Bancroft constructed a fireproof twostory and basement brick building, forty by sixty feet, with strong iron shutters covering all openings. On the door, a silver plate, lettered in plain script, announced "The Bancroft Library"--a collection now numbering 36,000 volumes. "The plain exterior of the substantial structure is somewhat relieved by the trees and flowers which surround it, the interior is conveniently arranged, and well lighted and ventilated," Bancroft noted. (Prospectus of the Literary Works of Hubert Howe Bancroft). The Bancroft Library at 1538 Valencia Street, San Francisco, circa 1890-1900. 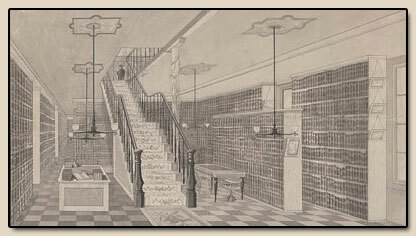 Not shown: Watercolor of the first floor of the Valencia Street library, in use from 1881 to 1906. Right: Photograph of the library building. "Plan, First Floor, Valencia Street." Manuscript, ca. 1880. The first floor housed the 16,000 volumes of sets and collections of various types, such as voyages and travels, periodicals, directories, and Mexican sermons; 500 files (about 5,000 bound volumes) of Pacific states and Mexican newspapers; maps, the card index; and Oak’s paper bags of notes. 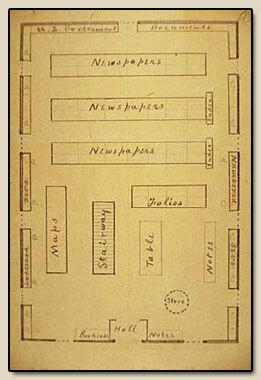 "Ground Plan, Second Floor, Valencia Street." Second Floor, library work area. Engraving, ca. 1881. On the second floor, Bancroft placed his "working library" of printed books, still arranged alphabetically and numbered one through 11,498. Here, too, were 450 volumes of reference works and bibliographies; 400 volumes of rare books; and 1,200 volumes of manuscripts, arranged in three groups: Mexico and Central America; California; and the Northwest Coast, including Alaska and British Columbia. Bancroft’s correction of "Mr. Bancroft’s Study" to read "The Author's Study" provides more than a little insight regarding his self-image. The Valencia Street Library, ca. 1881. 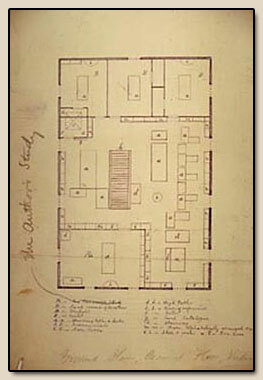 Original watercolor sketch of The Bancroft Library's accessions room. Finished drawing, in watercolor and ink, of the sketch above, prepared for a promotional brochure. Original watercolor sketch of Hubert Howe Bancroft’s study in the library. Hubert Howe Bancroft's Study in the Valencia Street Library. Drawing, ca. 1881. "Grocery sack" sample of Bancroft's indexing system, 1880s. As Bancroft looked towards using his library for a series of histories, he and his staff experimented with various ways of accomplishing Bancroft’s determination "to have the entire library indexed as one would index a single book." Eventually, they settled on a method of writing out--on sheets of legal-size paper with blank lines separating items--extracted notes, either quotations or summaries or references to the location of information. Each item had the territory, date, and topic in the left margin at the top and the title of the book at the bottom. These sheets were then cut apart and filed by Henry L. Oak in grocery sacks "property classified and labeled in territorial and chronological order." The writer requesting the paper bag labeled with his topic would soon have before him a stack of slips of paper of varying lengths, quoting, summarizing, or referring to every volume and page in the library containing data that he required. Hubert Howe Bancroft. Photograph, ca. 1880s. "Bancroft Library Time Book." Manuscript, 1883-1887. An annotation on the time sheet for September 1883 notes that "Mr. Bancroft left for Mex 1.9.83"--a trip to gather material for the later history of Mexico. Hubert Howe Bancroft. "Notes on Mexico in 1883." Manuscript. Bancroft travelled to Mexico to gather materials for the history of the country after 1800, but also to fulfill a "life-long desire to visit this region, and observe for myself scenes so long familiar through the imagination, and study more practically the people of whom I had thought and written so much." Here he recounts his visit to the Archivo General de la Nación. Henry L. Oak. Photograph, ca. 1880s. "List of Nevada Mss. (Pac. Mss. G)." Manuscript, 1880s. The histories were the product of Bancroft’s desire both to utilize the library and to make its contents widely accessible. They also, moreover, were a fruitful source of additional material for the library, for field workers gathered publications, documents and manuscripts, oral histories ("dictations," as Bancroft called them), personal narratives, copies of archives, and whatever else might prove useful in writing the history of a region. Shown here is a working list, compiled by Bancroft’s staff, of manuscripts gathered for the history of Nevada. 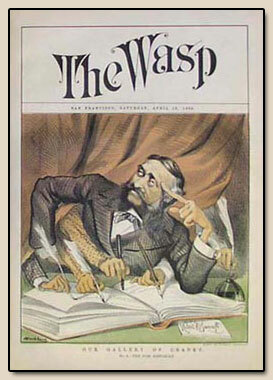 The Boss Historian," cover of The Wasp, 18 April 1885. Bancroft’s thirty-nine volumes were admittedly the work of many hands, although the "Boss Historian" did supervise and pass on the final product. The idea of production-line histories proved good material for The Wasp, an illustrated weekly magazine devoted to social and political satire, established in San Francisco in 1876. At the time of this cartoon, drawn by Henry Barkhaus, The Wasp was edited by Ambrose Bierce. As the production of the Works moved forward, Bancroft came under severe criticism for the actions of agents who, in securing statements or "dictations" from western pioneers, also pressed them to subscribe to the series. The enthusiasm of the moment, flush with the recollection of their own participation in historical events, tended to wane as succeeding volumes--and invoices-arrived. "Burning of The Bancroft Building." Photograph, 1886. As Bancroft neared the completion of his Works, he began to consider the disposition of his library. 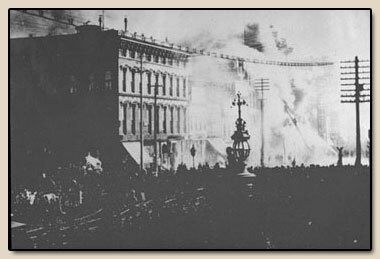 Then a fire, on April 30, 1886, destroyed The Bancroft Building on Market Street where, among other business activities, the Works were being printed and bound. Facing over half a million dollars in uninsured loss, Bancroft still was determined to reestablish his business and felt compelled to complete the promised volumes of the Works (which had been sold on subscription). The library, however, began to appear more and more as a luxury. "Building of the History Company. Market Street, San Francisco, Cal." Engraving, ca. 1890. After the devastating 1896 fire, which destroyed 12,000 volumes of his histories as well as the plates for a dozen volumes, Bancroft’s business investments, besides his library, consisted of little more than the Market Street site and the History Company, publisher of the Works. In rebuilding, he called his new structure the History Building. The History Company. Invoice for Adolph Sutro’s purchase of three copies of v. 31 of Bancroft’s Works, 12 April 1890. Of particular interest is the depiction of the History Company and The Bancroft Library joined radiantly by the bookcase containing the thirty-nine volumes of Bancroft’s histories, the marriage of business and book collecting. "How H.H. Bancroft Did His Work," New-York Times, 20 July 1891. The title of Bancroft’s autobiography conveys the dual meaning of "industry:" assiduous work and commercial production. Both of these were hallmarks of his life and literary efforts. Two chapters in particular have importance for this history of The Bancroft Library: "From Bibliopolist to Bibliophile" and "The Library." In these he recounts in detail how he turned to book collecting, the tremendous growth of his library and his utilization of his collection in his histories. The autobiography was published as v. 34 of the Works as well as separately. The salesman’s prospectus for the popular edition, with blank leaves at the end for lists of subscribers, is shown here. 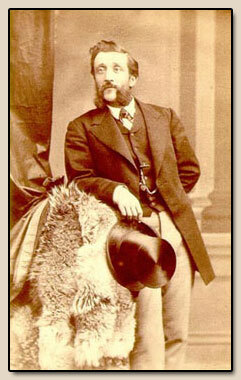 Even with his histories nearly completed and the period of most intense collecting--1868-1882- behind him. Bancroft continued to purchase widely, as evidenced by these booksellers’ invoices from San Francisco, Paris, and Austin, Texas.